Fees associated with filing trademark application in Colombia as well as other trademark fees are available in the fee calculator. Multiple-class trademark applications are possible in Colombia. The class headings are not admitted by the Patent and Trademark Office, the particular goods and/or services must be indicated. It is necessary to provide a certified copy of the priority document translated into Spanish no later than nine months from the foreign filing date. A copy of a Power of Attorney signed by the legal representative of an applicant must be provided within two months from filing a Colombian trademark application. Legalisation is not required. The Colombian trademark application may be opposed within 30 working days from the publication of the application. In case the opposition is filed the applicant is given an additional 30 days period to answer the opposition. No official grant fee is stipulated. The validity term of a trademark in Colombia is ten years from the date of registration. A trademark in Colombia may be renewed for successive periods of ten years. A request to renew trademark registration must be submitted within six months before the expiry date or within a six-month grace period. The validity of a trademark in Colombia may be cancelled if the owner of a trademark has not been using the said trademark within three consecutive years following its registration. 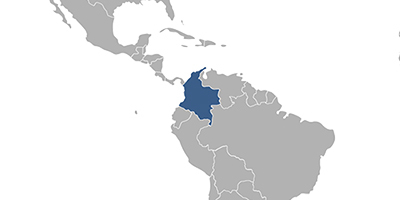 Foreigners must perform the trademark prosecution in Colombia through a Colombian trademark attorney at law. Words or a combination of words; pictures, figures, symbols, graphic elements, logotypes, monograms, portraits, labels, and emblems; sounds and smells; letters and numbers; a color demarcated to give it a specific shape, or a combination of colors; the shape of a product its packaging or wrappings; any combination of the signs or means indicated in the items above are registrable as a trademarks in Colombia. Online Search Databases: Colombian Trademarks, International Trademarks.